Garlic, where and how to store? Garlic - very useful in fresh form. 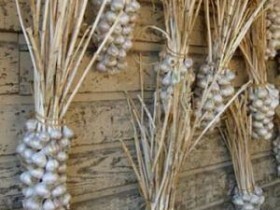 To preserve it, adhere to the rules, not only, how to store garlic, but also a collection of garlic harvest. dig garlic, basically, in late fall. But it does not matter. different varieties, and each different maturity. to understand, to dig or not, simply pull out some heads and check the color and the number of layers. Ripe garlic resilient, lasting, cloves well packaged, reserved a sufficient number of films gray color. When ready for harvest, we must take the fork and knife. The knife is needed to cut the tops, but be sure to leave about 20 cm, then the processes will be useful for storage. Then carefully dig fork, not to damage. Shaking of dirt, add up to the ground. It is not necessary to impose a bunch, only next to each other. Garlic should be dry. If you distribute the slide, it is dry, as expected. Leave in the open air, you can overnight, if not going to rain. 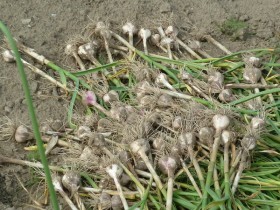 After the first dry, garlic two weeks left in the back. Important: the room should be well ventilated. While drying Culture, must be addressed, where to store the harvest. Store garlic can be in the cellar and in the apartment. If you decide keep in the cellar, observe the correct temperature in the room. It should not be above zero, otherwise garlic sprout. And it should not be less than three degrees, and then it just freezes. An ideal variant maintaining the temperature, hang on the wall thermometer. House garlic is also good preserved. You can even in the kitchen, but it is better on the balcony, if it is insulated. for example, OK, if you live in my house. It has a lot of cool places, where you can leave the garlic for storage. Before, how to send the harvest to storage, decide, you need opment? If garlic is stored in bulk, it is better to cut, leaving approximately three centimeters. Storage box must not be made of metal or plastic. Only wood or cardboard. Garlic does not like light. Consequently, store in a dark place. The best way, to keep the garlic, braid it in braids. This method is convenient to store in the house. He hung a braid and need to cut off the head. drags, as an ordinary maiden spit. If foliage is not enough, You can skip rope or strips of rags. Many are used to strengthen the spit dill. Stem his long and flexible. This is a very practical option, keep in suspense, garlic on the whole mind and breathe freely. It persists for a long time. The first to use large head, because they spoil quickly. Here are useful tips, how to store garlic. About own harvest should care, that the work was not in vain.